Paisible, maison décorée artistiquement, quartier calme. Le propriétaire exige un séjour minimum de 5 nuits. Cette spacieuse et privée 3 chambres, 2 1/2 salles de bain maison est située dans un quartier calme et sécurisé, North Coconut Grove, à distance de marche des restaurants et du centre-ville de Coconut Grove. Capacité 5-6. Il est situé dans un quartier familial. Cette maison est le mieux adapté pour les vacances en famille et en couple ainsi que les voyages d'affaires. Les fêtes et les réceptions ne sont pas encouragées et doivent être approuvées par le propriétaire avant la réservation. Cette spacieuse maison à deux étages est décorée de manière artistique et meublée avec des pièces uniques, certaines conçues par le propriétaire à partir de bois durs locaux. Il est niché dans un quartier calme et familial. La maison a une télévision dans la chambre principale à l'étage avec les chaînes locales et le câble de base. Il y a un escalier en colimaçon étroit, qui est le seul accès au deuxième étage. Pour cette raison, il n'est pas bien adapté aux personnes âgées ou aux très jeunes enfants. Rocky and Amy were great. The place was perfect for the 5 of us. Great care has been taken with the decor of this modern, light-filled home in Coconut Grove. The location is ideally situated for sightseeing and access to all sites in the Miami area, and is in a wonderful walking neighborhood--filled with birds and peacocks! It is so peaceful and quiet, and filled with artwork. The owner was very attentive to any concerns and went the extra mile to make sure we had appropriate recommendations for eating and sightseeing, which were all outstanding. A few minor upgrades would make this a 5-star property (deck lounge chairs; pillows/sheets; beds were very comfortable). We would definitely consider coming back to this beautiful home. Great location, well equipped and very complete and comfortable! We spent 6 nights over thanksgiving weekend at the home. 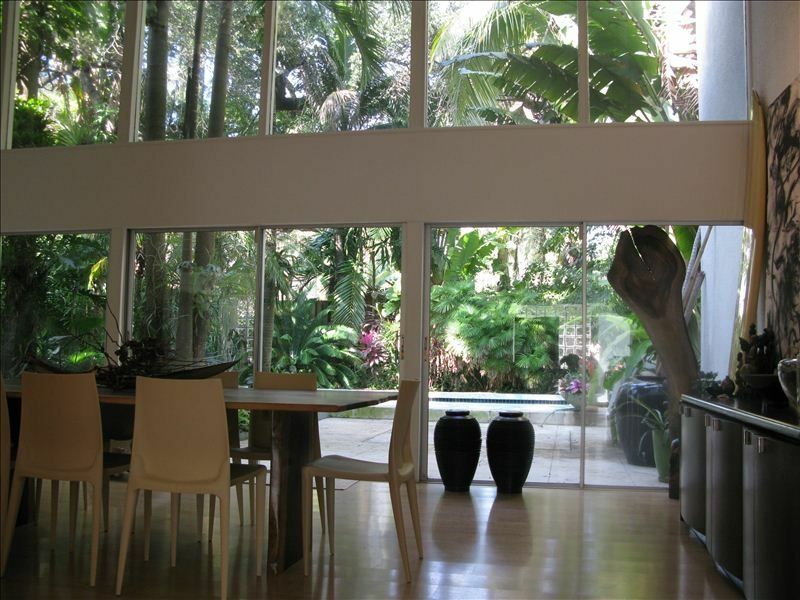 It has an amazing feeling of spaciousness with a window wall overlooking a jungle garden and pool. Absolutely loved it. The place is super for six people. Comfortable beds and good bathrooms. Owner (rocky) was great and communication was excellent. Would stay here again. This place offers everything that you need for a great family vacation. We stayed as a family of 5 and had enough space with the 3 bedrooms and 2 bathrooms. The house is very uniquely decorated, you may like it or not - it has style and you can see the attention to the detail. We loved it. Everything was clean and fully functional, the pool was cleaned at least once a week during our stay. We loved the barbecue grill outside and the huge lunch table inside. The kitchen was fully equipped, there were spices, foils, bags etc available, all the tiny things that you miss if you haven’t thought about it. We had a great time and would always come back! We enjoyed our holiday so much and we’ll definitely come back to this wonderful place!!!!!! towels, soaps shampoo inside the bathroom, as well as the kitchen was absolutely generously equipped!!!!!!! Because our days were full of activity and the later nights we enjoyed on the poolside between this marvelous nature with the noice of the crickets!!!!! Rocky’s house was perfect for our girlfriends weekend! The house was beautiful, and clean. Rocky was so nice to give us recommendations of places to check out. Two out of six of us girls live on the west cost and our flight wasn’t until 8 pm, Rocky was nice enough to let us stay the full day until we had to leave for the airport. His art collection around the house is beautiful and something to be admired. The pool and back yard seemed like you were in your own piece of paradise. All and all we loved this house and would absolutely stay again! We're so happy you enjoyed the house and your time in Coconut Grove. Thank you for leaving the house in such great shape! You are welcome back anytime. We require a signed rental agreement before or upon check in. Thank you for your trust and confidence. We hope you enjoy your stay!